Renewed Hope Housing Advocates began in 1998, as an organizing effort of the Buena Vista United Methodist Church, long an activist church in Alameda. Vickie Smith, a member of the church’s community development committee, suggested a focus on the early stages of gentrification in the West End. She had grown up in the old Navy housing projects on the West End and been through the fair housing battles of the 1960s and she began to notice people were leaving as rents were going up in the wake of the dot-com boom in digital technology. The committee responded to Vickie Smith’s warning by recruiting West End residents and activists Jeanne Nader and Peggy Doherty. Lynette Lee, then director of the East Bay Asian Local Development Corporation and Rev. Michael Yoshii were also part of the committee. Peggy was also a member of St. Barnabas Catholic Church on the West End, which eventually lost one-third of its parishioners to rent displacement. In that period, the East Housing, former Navy housing along Atlantic Avenue, was scheduled to be developed by Catellus Corporation and when the committee approached then-City Manager Jim Flint, he told them gentrification was coming to Alameda and there was nothing they could do about it. In response, the group decided to name itself Renewed Hope organize itself around a campaign to block this plan and promote the conversion of the Navy housing to affordable housing. It was drawing on and honoring the work the pre-existing housing advocacy group, Housing Opportunities Provided Equally (HOPE) that had closed up on the early 90’s. With the help of a hired community organizer Cynthia Okayama Dopke, Renewed Hope mobilized a large group of people of all races, largely from the West End, starting with an interfaith witness held at the gates of the former naval base housing, and moving on to staging marches, turning out crowds at council hearings and holding candidates forums for the 1998 elections. The activists saw an opportunity to link the displacement directly to a cause — the overheated market, which they could tell would soon collapse. And they had a solution they could offer: Instead of building hundreds of new expensive homes, why not save the housing that’s there and — renovate it as affordable family housing? The houses were largely three- and four-bedroom units and could have been rehabilitated and sold, at the time, for between $125,000 and $160,000. The rental units would have ranged from $700 a month for two bedrooms to $1,350 for four bedrooms. This effort to rehab existing housing was crucial because Measure A, passed in 1973 to stop the destruction of Victorians, blocked the development of new multi-family projects. Lynette’s EBALDC team prepared an alternative proposal for financing the renovation work. The term “workforce” housing came into use because Renewed Hope wanted to show that cost of housing was becoming too high for people with regular jobs and decent incomes and that many were renters who would love to be homeowners. Alameda, by the way, is about 50 percent renters. The city often used this fact as proof that it already had enough affordable housing. The city went ahead with plans to tear down these homes and construct 485 large new homes, now known as Bayport, but 48 homes for moderate income homeowners – roughly in the $60,000 range for a family of four in 2000 – were included, as required by state redevelopment law. Despite the splendid organizing, the battle was lost. It wasn’t the time to prevail, but Renewed Hope did restart a debate that was cut off in the early 1970s. And that was: Who deserves to live in Alameda? For the next 15 years, the group — under presidents Tom Matthews (who died in 2007) and later, Laura Thomas — would deconstruct and reconstruct the idea of what affordable housing could be and whom it should serve. Left with a small, but dedicated steering committee and some loyal supporters, Renewed Hope in 2000 began to focus on the Naval Air Station site because it would bring a developable land mass that was half again the size of Alameda into the city, and it was in the West End, locus of the East Housing struggle. Eve Bach of Arc Ecology, a non-profit organization that worked on base closure issues, had joined the RH steering committee and she persuaded members to sue the city based on an inadequate EIR done by the Navy in approving the Catellus development. That was the pretense. The aim was to demand an affordable housing mandate for the base and RH won a settlement agreement calling for 25 percent affordable housing. It also won Catellus’ commitment to providing land and funding for a 62-unit project of both rental and homeownership units, the Breakers, which opened in 2006. We had won our bid for a bigger portion of affordable housing, but the Measure A multi-family housing ban meant developers would be forced to build affordable housing that was all detached single family or duplexes, an expensive proposition for them. And, sure enough, for more than a decade Measure A was one of the big reasons development at Alameda Point didn’t get off the ground. The steering committee spent many years presenting the argument for multi-family housing and against Measure A, which was the subject of a 2008 public forum. Generally the city balked at bringing this problem out for public discussion and continued to expect prospective developers to solve the problem for them. During the same period, Renewed Hope pushed the city to adopt an inclusionary ordinance calling for developers to build 15 percent affordable units as part of a project rather than donate funds to the city’s affordable housing program, which was seen as a way for the city to spend money on insignificant homeownership subsidies. Along the way, the housing situation for low income folks became worse when a Florida investment group, the 15 Group, purchased the Harbor Island Apartments, a 615-unit set of buildings that housed many Sec. 8 voucher holders and had been built with a federal subsidy. In 2004, the 15 Group, which had allowed the buildings to deteriorate, announced it would be evicting everyone to make way for renovation and upgrading. Renewed Hope joined in the fight with legal and policy support, but the 15 Group got its way and Alameda lost a good portion of its Black population and took a $5 million hit to school district revenues with the loss of 300 children who were attending school. In 2010, the developer Sun-Cal attempted to clear the way for developing Alameda Point by qualifying an initiative to overturn Measure A and make building multi-family dwellings easier. Unfortunately, it also included the Disposition and Development Agreement as part of the initiative and Eve Bach’s analysis showed the DDA was a bad deal for the city. Renewed Hope felt compelled to oppose the initiative since it gave far too much power to the developer. In so doing, RH demonstrated it sided with the interests of the city over developers. Measure B lost by a landslide. Renewed Hope began rather cautiously to focus on using the Housing Element as another pressure tactic. Eve Bach had been bringing it up time and again, reminding us of the state mandate that each city to have a valid element in place, in which it had to demonstrate adequate sites were available and that there were no impediments to building affordable housing. The city had adopted an element for the 2001-2006 period, but it relied chiefly on unavailable Navy base sites and continued to assert that Measure A wouldn’t stifle the developers’ ability to finance affordable housing. RH sent a strong critique of the element to the state Housing and Community Development Department which used it to refuse to certify the city’s element. Left in limbo by the lack of direct sanctions against scofflaw cities in Housing Element law, the steering committee began to realize the base development was really stymied by Measure A and for affordable housing in Alameda to get off the ground, it had no choice left but to file a lawsuit over the lack of an element. At the time Urban Habitat and Public Advocates were suing the city of Pleasanton and the success of that helped to bring the group around. It was evident how much power RH could wield doing the same. At the same time, state policies under SB 375 (designed to address greenhouse gases) were starting to put more pressure on cities to get certified elements. In the meantime, the makeup of the council changed to embrace a more sympathetic understanding of affordable housing from a standpoint of social justice and community stability. It became clear they were well aware they were vulnerable to a suit and would appreciate the political cover a threatened lawsuit would give them to embrace the housing element. Eve died of cancer in early 2010 but before that she introduced the steering committee to people at East Bay Housing Organizations and Public Advocates and with them we gained some really important allies in taking on our decision to press a lawsuit. As individuals, we felt somewhat vulnerable, knowing we could be seen as people who were attacking the integrity of our city and knowing we had support, even outside Alameda really gave us energy and — resolve. The minute we began to rattle our swords – we sent the city a demand letter – they swung into action. The City planner Andrew Thomas came to the council and planning board with a time table which pretty much matched the one we demanded. City Manager John Russo was in support as well. It was fall 2011 and it needed to be done well before the new period ensued in 2014. In the spring of 2012 with the aid of attorneys from the Public Interest Law Project in Oakland and Public Advocates in San Francisco, RH, and city staff drew up the city’s draft Housing Element for 2007-2014. Unable to use sites on the base, which was not in city hands, most of the sites were in Alameda’s northern waterfront, near the Estuary and towards the West End. Most of the rest of the town, where there might have been more opposition had no sites left. Our biggest challenge was creating some real incentives for developers to build affordable housing. The housing element law sets a fairly low rate of 30 units per acre as standard for affordability. If a developer meets this minimum, but creates no affordable units, the state is satisfied. We worried that 30 units an acre wouldn’t attract a developer who would be able to finance the addition of affordable units, and we knew that greater densities could set off some major opposition. Since we were asking the city of Alameda to override its charter amendment against multi-family housing to adopt an element in compliance with state law — we were stuck at this point. To get past this limitation, we created overlay zones where 30 units was the standard but if a developer was interested in doing at least 50 percent affordable, he or she could use the state density bonus to boost it to 40 units per acre. By applying this zoning to about half the sites designated, the city was able to reach its required Regional Housing Needs Assessment numbers (the amount of housing assigned to it by the Association of Bay Area Governments). The council happily, even joyfully, passed the element in July 2012 even as the last pro-Measure A member trying to rally their supporters, but could not muster many people. They seemed to have lost steam, while Renewed Hope never gave up. The latest Bay Area housing crisis has only made the need for affordable housing more important. In addition it has created a greater acceptance for it among Alameda’s rank-and-file citizenry. The struggle between the desire to keep Alameda a livable community for SOME and a livable community for ALL hinges, in part, on housing and transportation issues. But it actually requires everyone’s acknowledgement of what makes a community whole beyond good schools and neatly tended building facades. As a group we have triumphed in changing city policy, but we hope to build something more. Many of the original Renewed Hope supporters were people of faith who were moved by Martin Luther King’s belief in a beloved community where reconciliation and redemption are found. It is something many of us want for Alameda along with housing justice and security, a place where compassion and solidarity thrives. Last week’s unveiling of President Trump’s budget philosophy “America First” decidedly dismisses the needs of ordinary Americans. The proposed budget decimates almost every domestic program funding, including 6 Billion dollars from the Department of Housing and Urban Development, also known as HUD. Affordable housing as Americans know it stands to be all but eliminated, not that it was adequately funded in the first place. The time for resistance is now and it begins with CarsonWatch. CarsonWatch aims to organize housing activists to fight back against defunding HUD. Resistance has proven effective at disrupting the Trump agenda with the Affordable Care Act, the same must be done for affordable housing. CarsonWatch provides updates for participants to know when resistance is needed. It is organized by the Poverty & Race Research Action Council, the Lawyers’ Committee for Civil Rights Under Law, and PolicyLink. Sign up for their email alerts and be ready to fight for fair accessible, affordable housing for all. Renewed Hope stands alongside these organizations as California endures an unprecedented housing shortage. California’s housing crisis can seem insurmountable. Reports vary on just the exact number of homes that need to be built. The California State Housing Assessment says 1.8 million homes by 2025. The McKinsey report doubles that number, saying we need 3.6 million homes to bring back a healthy housing market where folks can find many homes to suit their various needs. Rental housing displacement has been going on since late 2013. Alameda’s rent stabilization laws went into effect in April of 2016. It’s readily apparent that housing construction needs to be fast tracked and yet our state is still not building at a rate that will see this housing shortage disappear anytime soon. Activism is hard work and it’s a collaborative effort and while we’re seeing growing numbers of people joining the movement and creating pro-housing organizations of their own, it’s still easy to get burnt out. What’s the point of working so hard if a problem isn’t being taken seriously, or the funds aren’t there to address it, and the lawmakers with power are dragging their feet? In moments like these, it’s important to remember that Renewed Hope itself is the continuation of Alameda’s fair housing movement in the 1960’s and that Lois Pryor, one of the organizers of that movement is still an activist with us today. This brings to mind a recent article from the UK’s Guardian: Protest and Persist: why giving up hope is not an option by Rebecca Solnit. It shows that even if an activist movement does not achieve its initial aims that the movement has ripple effects that can last for generations, and that this hard work is worth doing. Activism is a long game and those new at it must cultivate a point of view that embraces continued spurts of activism and rest when the time calls for it. However, as Rebecca Solnit’s piece shows: we must never give up. As Alameda and many other California cities contemplate how they plan to build the 1.6 million low income homes they need by 2025, affordable housing advocates are using data from a few different resources. These data are vitally important as despite the crisis many cities still oppose new housing in favor of the needs of existing residents, many of whom have stable housing that is already paid for, or permanently rent controlled. As the recent Harvard study recently found even renters are getting into the NIMBY act, wanting to preserve the views and benefits they’ve enjoyed for decades, while younger generations, immigrants and migrants struggle to pay for affordable housing. In some cases, even those who benefit from subsidized affordable housing are opposed to new development, unable to understand that these folks just want the same thing that they already have: stable affordable housing. Fortunately in the fight to approve and build new affordable housing Renewed Hope and other housing advocates have hundreds of pages of verified data that shows how we got to the housing crisis, how much we need to build to fix it and where those homes should go. The 2017 California State Housing Assessment from the Department of Housing and Urban Development. This is a broad overview of the housing shortage, showing how many homes California has built in the last hundred years, and revealing that our housing production has slipped by building only half of what we require on an annual basis for the last ten years. It further acknowledges that the folks most impacted by this crisis are low income folks who do not have the flexibility in their budgets for rising rents and become much more likely to become homeless. This report also goes into some of the reasons that we haven’t been building at the rate required for a healthy housing market. California state law requires that the Department of Housing and Community Development (HCD) report annually on housing construction, grant and loan fund distribution, and the demographics of the people HCD programs has assisted. In addition to the narrative summary of the report, there are tables towards the end that make it easy to see which counties are doing their part in the shortage and which ones are making it worse. It’s not just the HCD that’s concerned with this housing shortage. As California’s Assemblymembers and Senators consider solutions the CA LAO has come out with a more detailed look at what prevents individual California communities from building needed housing and considers solutions to target those roadblocks. The report’s conclusion is rather startling as it asserts that nothing will change until housing advocates encourage a shift in views about housing development across the state. This means that education is a necessary endeavor as we work to build housing and that these reports can provide the foundation to do that education. This might be one of the most important documents of the bunch. While the HCD talks about building 1.8 million homes by 2025, the McKinsey Global Institute puts that number at 3.5 million. Considering that they also assert that as many as 50% of Californians in certain regions are paying more than 30% of their incomes in housing and utilities it’s important to determine what the true number of housing units we will need. It’s important to read this report as one contemplates some of the assertions of the HCD report. There are statistical nuggets here that can change the hearts and minds of Californians hesitant to build the dense, urban cities that we need. Alameda has been improving its approach to affordable housing in the past three years, however more work needs to be done. We have to determine the best path to ensure that as many people as possible get access to housing in areas of job growth and transit infrastructure. Alameda is primed in its placement between Oakland and San Francisco to become a vibrant part of the growing Bay Area metropolis, especially as regional transit planners consider adding a second BART tube and a BART station in our city. The documents shared today can help us prove that when folks with stable housing oppose new development in reliable job corridors, that they are directly contributing to increases in homelessness and suffering among vulnerable populations. A simple mind shift towards urbanism could be the starting point to build an equitable California with a healthy housing market for all. A great article from the National Housing Institute goes into a unique perspective on what prevents middle income housing from getting built. Writer Rick Jacobus says it’s not all anti-greed attitudes towards developers and zoning. Instead he proposes that the aesthetic design requirements also add complication and cost to developments. Both Catellus and Tim Lewis are considering increased numbers of “affordable by design” housing in their newest developments. Sean Whiskeman noted at Monday’s planning board meeting that these units would be 800-1500 square feet and between 1-2 bedrooms. The idea is that the size and layouts would be designed in a way that keeps costs down and enables the developer to charge less. He even said that these homes would be in the $500,000 range. Time will tell whether that will bear out or if the market is so hot that those units end up in the much less affordable $600,000 range. Previously these kinds of homes were called “work force housing”, however these units were still at market rate, which remains way above what’s affordable for many working families in the Bay Area. As our state continues to endure a housing shortage of crisis proportions more solutions to densify and increase overall housing numbers are desperately needed, as well as initiatives to change perspectives on new housing development. Read Why Aren’t We Building Middle Income Housing here. Lois Pryor has been fighting for housing rights in Alameda for a long time. 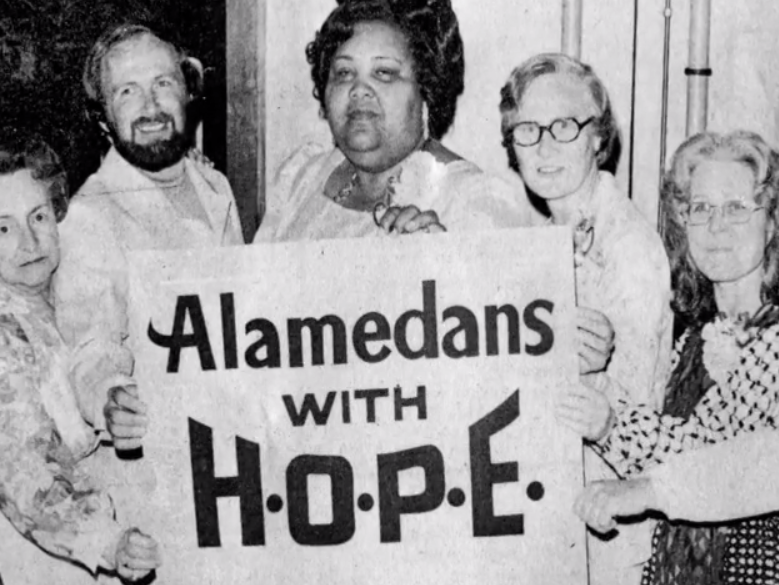 This video is her account of the early days of Alamedans with HOPE (Housing Opportunities Provided Equally) and their fight for housing rights in Alameda. Her dedication to these issues is amazing and we’re honored to work beside her.